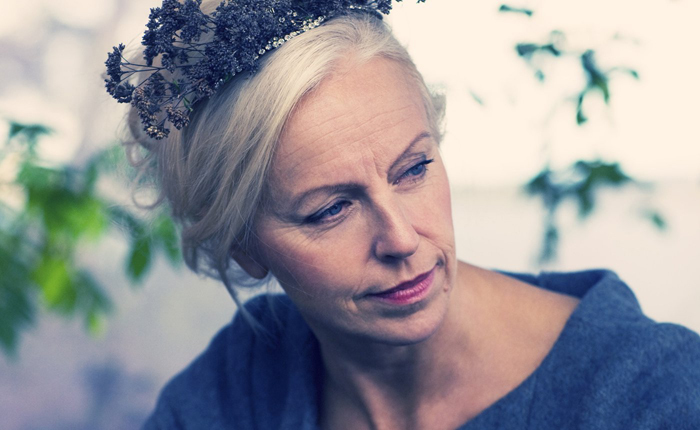 “I have copious amounts of energy,” said Grammy Award-winning mezzo-soprano Anne Sofie von Otter during a recent phone interview from her home in the Swedish countryside, “And I’m very thankful for that asset.” The answer comes in response to the question of how the celebrated singer continues to stay in demand, while maintaining a a seemingly tireless performance schedule as diverse as it is ambitious. The first half of 2015 sees the intrepid Swede starring in a new production of Kurt Weill’s Rise and Fall of the City of Mahagonny at London’s Royal Opera House, appearances as Waltraud in Götterdämmerung in Vienna, and the premiere of a new work by Hungarian composer Péter Eötvös with the New York Philharmonic. And those are just a few of the highlights. Yet von Otter is beginning 2015 with the kind of unique collaboration she enjoys, a five-city North American recital tour of German and French song with award-winning pianist Angela Hewitt. The tour kicks off at Toronto’s Royal Conservatory Friday night, 9 January 2015, and continues to Mandel Hall in Chicago Sunday afternoon, as part of the University of Chicago Presents series. Subsequent concerts will be given in intimate venues in Boston, New York City and San Francisco. “It’s not so usual to have two ladies on stage, one playing the piano and one singing,” added von Otter. This is particularly rare for the singer, who is usually seen in concert with keyboard collaborator Bengt Forsberg, with whom she has worked since 1980. The first half of the concert will feature German repertory by Brahms, Beethoven and Schubert, including well-known Romantic lieder such as Schubert’s tender Im Abendrot, and Brahms’ Von ewiger Liebe. The second moves into Francophone territory, musical terrain that both von Otter and Hewitt are taken with. Pieces to be performed include works by Fauré, Debussy, Chabrier, and the infrequently heard female composer Cécile Chaminade. This healthy dose of realism is likely what keeps von Otter perfecting songs and learning new roles at an age when many of her peers begin to show signs of vocal fatigue. The daughter of a Swedish diplomat, von Otter spent her youth in Bonn, Stockholm and London. She studied voice in her native Stockholm and at London’s Guildhall School of Music and Drama, before embarking on a fruitful three-decade career in leading opera houses and recital halls the world over. Tall and endowed with a natural grace, von Otter has sailed effortlessly into Hosenrolle and other mezzo faire, while maintaining a busy schedule of recital and soloist engagements, recording dozens of albums for Deutsche Grammophon, and more recently, her current label, Naïve. Von Otter also has a penchant for collaborating with other artists and is not afraid to venture beyond the classical milieu. She has recorded an album of ABBA covers and collaborated with the likes of pop legend Elvis Costello and jazz pianist Brad Mehldau. Until that time comes, there are roles to be learned, recordings to be made and plenty of art songs to be sung. At the age of eighteen, Bach was offered the job of organist at St. Boniface Church in Arnstadt. In spite of a rather generous salary for so young a musician, he bristled at the poor quality of singers in his choir and the appointment only lasted a few years. 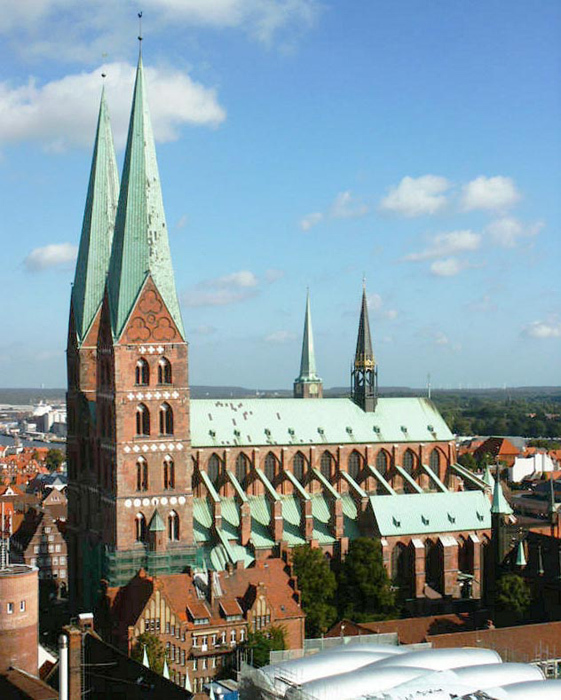 In October 1705, Bach requested leave to travel to the northern city of Lübeck to hear the great organist and composer, Dieterich Buxtehude, and “take in all I can of his art.” Granted four weeks off, he set out for Lübeck to meet his idol, traversing the 260 miles in early winter and reportedly on foot! Instead of a month, Bach ended up staying three months before returning to Arnstadt a changed man; he had found his inspiration. On the west side, between the two pillars under the towers, one can see the large and magnificent organ, which, like the small organ, is now presided over by the world-famous organist and composer Dietrich Buxtehude. Of particular note is the great Abend-Music, consisting of pleasant vocal and instrumental music, presented yearly on five Sundays between St. Martin’s and Christmas, following the Sunday Vespers sermon, from 4 to 5 o’clock, by the aforementioned organist as director, in an artistic and praiseworthy manner. This happens nowhere else. In former times the citizenry, before going to the stock market, had the praiseworthy custom of assembling in St. Mary Church, and the organist [Tunder] sometimes played something on the organ for their pleasure, to pass the time and to make himself popular with the citizenry. This was well received, and several rich people, who were also lovers of music, gave him gifts. The organist was thus encouraged, first to add a few violins and then singers as well, until finally it had become a large performance, which was moved to the aforementioned Sundays of Trinity and Advent. The famous organist Diederich Buxtehude decorated the Abendmusiken magnificently already in his day. His successor, Mr. Schiefferdecker, did not fail to maintain the reputation of these concerts and even augment it. But our admirable Mr. Kuntze has brought them to the highest level. He has gotten the most famous singers [both male and female] from the Hamburg opera; he has even employed Italian women. Like most musically inclined Germans in the early 1700s, Bach knew about the Abendmusk concerts and undoubtedly timed his visit to Lübeck accordingly. He also must have known that a four-week leave would not be adequate to fully take in the concerts, but he failed to mention this detail before leaving. Bach was not entirely happy with his post in Arnstadt, so missing more than a month of work bothered him less than it upset his employers. Interestingly, however, when Bach returned and was reprimanded, his most serious offense was not his AWOL status; it was for introducing strange notes and musical gestures into his services in January and February 1706! The experience of hearing and playing Buxtehude’s music in the Abendmusiken (some have suggested that he performed in some of the concerts) had inspired Bach and directly influenced his musical voice and ambition. It’s not very often that one receives international recognition two hundred fifty years after being placed in the ground. But with help from University of Wisconsin-Madison musicology professor Charles Dill and a host of international scholars and musicians, that’s exactly what’s happening for Jean-Philippe Rameau. On 13 November 2014, the first of these events will kick off with a discussion about the expressive qualities in Rameau’s music (with visiting opera director David Ronis and Professor Anne Vila of the Department of French and Italian), followed by a concert the next day featuring Marc Vallon, UW-Madison professor of bassoon, in a mostly-Rameau concert. You can read the full schedule of events here. University of Wisconsin-Madison (UWM) How did you first become interested in Rameau? Charles Dill (CD) Modern audiences often view all composers of the past as struggling visionaries. This may be true of composers after Beethoven, but it isn’t true – or isn’t true in the same way – for earlier composers, even composers like Mozart or Haydn. They considered themselves to be working at a job. They wrote pieces to suit their performers, and the compositions were “disposable.” If something needed changing, the composer changed it, generally without much grumbling. They didn’t continue to garner attention for decades. What first interested me about Rameau, then, was that he revised his operas extensively and these revised versions continued to be performed. This suggests all sorts of remarkable things about him and his works. Notably, he was alert to how audiences responded to his works to an unusual degree, and he felt some kind of obligation toward “getting the work right,” as it were. That’s a very modern way of thinking about music. Because of this attitude, he also took risks as a composer. He was a remarkably creative individual, and he was rewarded for it. His works dominated French opera for a period of fifty years, until well after his death. 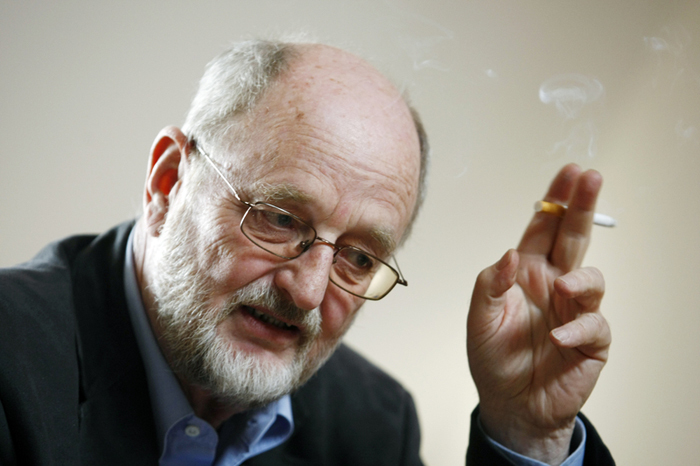 For his time and place, this truly was an unusual relationship between composer and audience. Add to that Rameau’s work as a theorist. 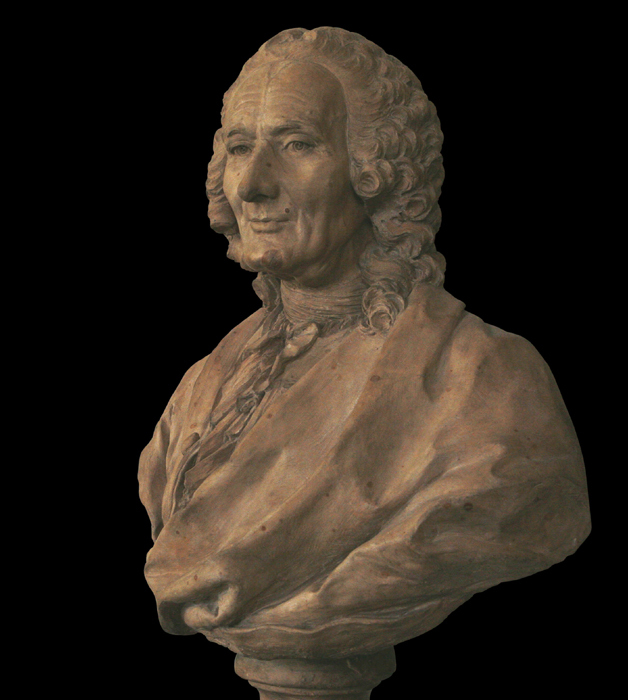 Thinkers had been speculating about how music works for as long as music had existed, but Rameau was the first to envision a comprehensive system that accounted for all of its aspects: how keys or tonalities come into being, why some harmonic progressions are more effective than others, how musical knowledge influences performance. We still employ his basic terminology for describing fundamental principles of music – chord inversion, tonic, dominant. There were flaws in his ideas, to be sure, and there have been countless other systems proposed since that make similar claims, but if you imagine music as an organized, coherent system – something we do every day – then you are, to a degree, following in his footsteps. UWM How did you become a Rameau specialist? CD I was fortunate to be in the right place at the right time. When I began working in Parisian libraries in the late 1980s, as a graduate student completing my degree, there were only a handful of people studying Rameau. Students from that generation have done influential work. Thomas Christensen explained the development of Rameau’s music theory, Sylvie Bouissou became the general editor of the Rameau edition, and William Christie specialized in interpreting Rameau’s music in performance. I was interested in Rameau’s relationship with audiences. Music criticism was still a fledgling enterprise in the eighteenth century, and yet his compositions elicited strong opinions, both for and against. He was one of the first composers to be treated not simply as a commodity, but as a public figure, one of the first to take that role seriously. To an unusual degree, he felt the need to experiment in his compositions, and yet he was also forced by circumstances to consider listeners and their perceptions in everything he wrote. After all this time, I still find this story remarkable. Times have changed. Nowadays, France recognizes Rameau as one its most representative composers and devotes time, money, and effort to developing our knowledge of him. A small army of dedicated French researchers is poring over every available source and producing first-rate scholarship. They’re doing wonderful work. UWM What contributions have you made to scholarship? CD When I began writing about Rameau, there was a longstanding trend to approach composers solely from the vantage point of what they wrote. We could describe this as the “great composers” or “great works” approach. Discussing composers in this way cuts out some of the most interesting material: what audiences believed, how they liked what they heard, how they received the composers, and how composers responded to criticism. My book, Monstrous Opera: Rameau and the Tragic Tradition (1998), which Princeton University Press has recently reprinted as part of its Legacy series, addressed some of these questions. As an eminently public figure, Rameau was subject to intense scrutiny. Some critics distrusted opera as an overly sensual medium, and some regarded Rameau’s colorful music as an especially egregious example. Rameau encouraged these kinds of responses. Where earlier composers generally wrote simple, unobtrusive music, Rameau wrote music that demanded attention. 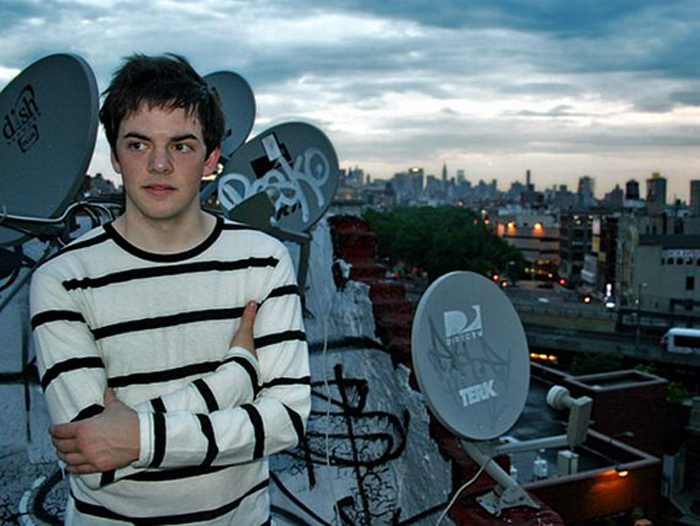 In a way, then, he challenged critics and audience members to define their expectations regarding music openly and publicly. It is telling that, during the period in which he became popular, audiences changed, coming to resemble modern audiences more and more: they began to learn difficult and complex music by heart, they grew more quiet and became more attentive during performances. UWM How does Rameau fit in with other well-known composers of the day? CD Rameau was two years older than Handel and Bach, almost an exact contemporary. Interestingly, although there’s no evidence to suggest he knew their music well, he helped popularize in France the kinds of music they were writing. From the Handel side of things, he took the kind of virtuosic playing and singing we associate with Italian composition, and from the Bach side, he took an interest in complex counterpuntal and harmonic language. To these he added an extraordinary sense of color – few at this time were combining orchestras and voices in such surprising ways – and an endless gift for invention comparable to Bach’s and Handel’s. During the late 1740s, a faction arose at the French court that wanted to set limits on how many operas Rameau could compose, because they felt he was dominating the music scene so completely. UWM What activities have taken place around the world this year, and where? CD Well, as is always the case with composers, there have been performances around the world – in France and, more generally, Europe, obviously, but in the states as well, notably in New York and Washington, D. C. In fact, a phone app has circulated in France so that one can follow where Rameau is being performed every day this year. Raphaëlle Legrand, who teaches at the Sorbonne, has put together a fascinating year-long series of presentations, open to the public, that combine historians, music theorists, professional musicians specializing in period instruments, and professional dancers specializing in historical dance techniques. This project is called the “Atelier Rameau” and it has an excellent website. It has been especially interesting to have singers, instrumentalists, and dancers working together, because dance is so basic to Rameau’s musical style. Performers quickly developed a new sense of what was and wasn’t possible when they began talking to each other! The biggest events, however, were two international conferences that united all of the scholars currently working on Rameau. The first was held last March in Paris. Sponsored by the French national library and CNRS (Centre National de la Recherche Scientifique), the French government’s principal sponsor of scholarly research, “Rameau between Art and Science” was held over three days at the Bibliothèque Nationale, the Cistercian abbey at Royaumont (where an important research library is housed), and the Opéra Comique (which premiered a new production of Rameau’s comedy, Platée). The second, “Jean-Philippe Rameau: International Anniversary Conference,” was held at St. Hilda’s College, University of Oxford, this past September. It was part of a vast research effort, The Rameau Project, which is being overseen at Oxford by Graham Sadler and Jonathan Williams. Both conferences were remarkable. Among the surprises, those in attendance learned that we are still discovering eighteenth-century production scores for Rameau’s earliest and most important works, and that Rameau was the composer of the famous round, Frère Jacques, which he included in a recently discovered composition manual. I can honestly say that this past year has advanced our knowledge of Rameau and his music in unprecedented ways. 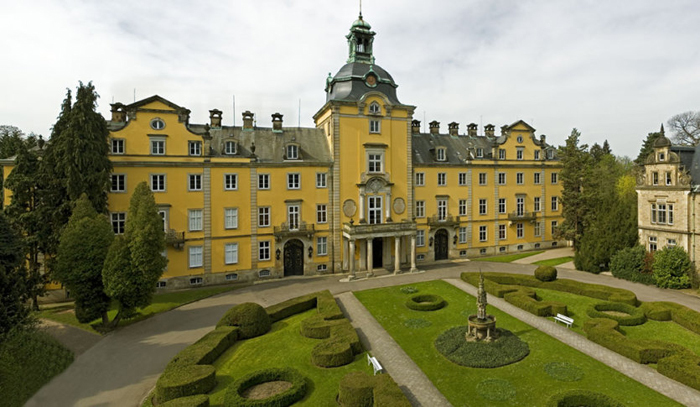 Wagner College music historian David Schulenberg’s new book, The Music of Carl Philipp Emanuel Bach, will be published in September 2014 by the University of Rochester Press, a partner of the humanities publishing house Boydell & Brewer. Of the four sons of J. S. Bach who became composers, Carl Philipp Emanuel (1714-88) was the most prolific, the most original and the most influential, both during and after his lifetime. This first full-length English-language study critically surveys his output, examining not only the famous keyboard sonatas and concertos but also the songs, chamber music, and sacred works, many of which resurfaced in 1999 and have not previously been evaluated. The book also outlines the composer’s career from his student days at Leipzig and Frankfurt (Oder) to his nearly three decades as court musician to Prussian King Frederick “the Great” and his last twenty years as cantor at Hamburg. Focusing on the composer’s choices within his social and historical context, the book shows how C. P. E. Bach deliberately avoided his father’s style while adopting the manner of his Berlin colleagues, derived from Italian opera. A new perspective on the composer emerges from the demonstration that C. P. E. Bach, best known for his virtuoso keyboard works, refashioned himself as a writer of vocal music and popular chamber compositions in response to changing cultural and aesthetic trends. Supplementary texts and musical examples are included on a companion website. 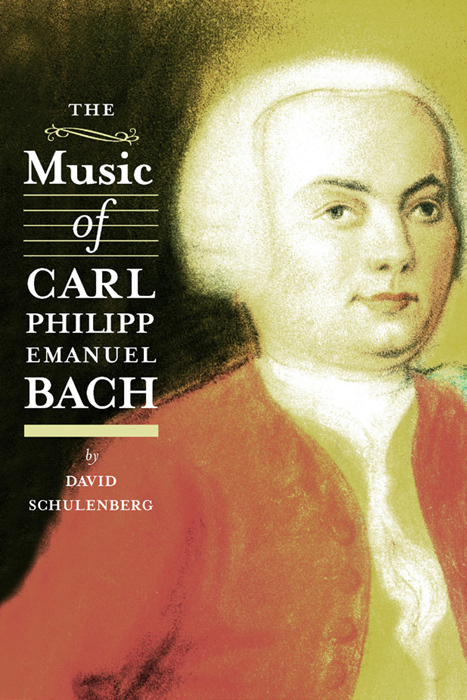 The Music of Carl Philipp Emanuel Bach follows the publication of Schulenberg’s The Music of Wilhelm Friedemann Bach (University of Rochester Press, 2010) as well as several collections of musical scores by Johann Sebastian, Wilhelm Friedemann and Carl Philipp Emanuel Bach edited by Schulenberg. 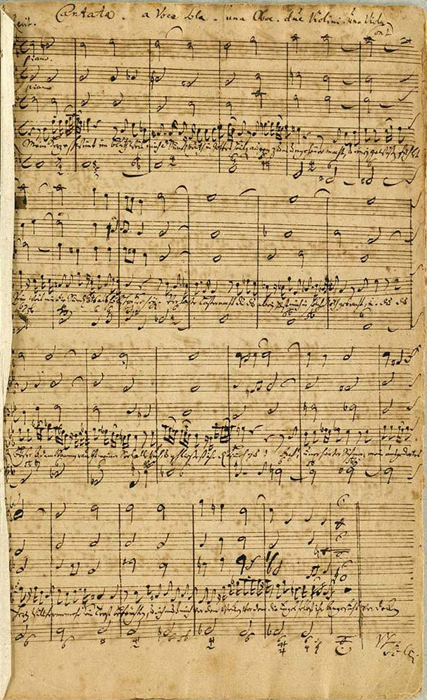 The autograph score of BWV 199. Mein Herze schwimmt im Blut (BWV 199) is a solo soprano cantata in eight movements that Bach first performed three hundred years ago at the Palace Church in Weimar on 12 August 1714. Originally scored for oboe, two violins, viola, and basso continuo, a later Leipzig version replaces the obbligato viola with a violoncello piccolo. The text for the eleventh Sunday after Trinity by Georg Christian Lehms, describing a sinner in search of redemption, had also been set to music in 1712 by Christoph Graupner in Darmstadt. The sixth movement of the work is based on the chorale Ich, dein betrübtes Kind by Caspar von Stieler. The famous brother, Emanuel “wrote the book” on keyboard playing and distinguished himself as an inspired improviser. All the great Classical masters acknowledged their debt to him. Never at a loss for a musical idea and a host of ways to express it, he created a body of works for keyboard rivaled only by Haydn’s for imagination and craft, yet many of today’s pianists are scarcely aware of his work. The eldest brother, Friedemann struggled to find stability in his life yet amassed a respectable record of professional achievement as an organist and composer. The rebellious brother, Christian left Germany, mastered the idioms of Italian opera, traded Lutheranism for Catholicism, and climbed to the apex of London musical society as the Queen’s music master, yet he left a widow in penury. The quiet brother, Christoph Friedrich settled into service at the small court of Bückeburg and spent his days composing in the fashionable genres and styles. During the conference, professors John Salmon and Andrew Willis, along with several other UNCG School of Music, Theater and Dance faculty, will perform works composed for clavichord, harpsichord, organ and fortepiano by the many members of the Bach family. This aria is among the most sublime gifts given in all of music, a vision far better suited for the soul than the stage. Yet Peter Brook tailors it meticulously to The Suit. The 89-year-old British director’s production of a short play based on a story by South African novelist Can Themba ends with this astonishing aria plucked out on dinky electric keyboard rather than sung as though musical lava profoundly pouring from a deep bass. 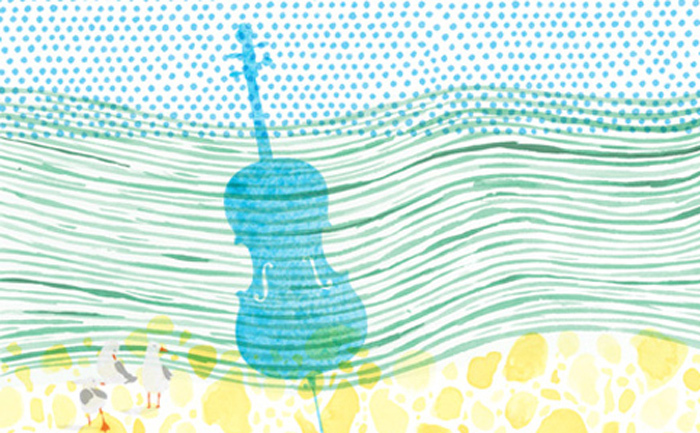 Brook has no pretense to present Bach as a call to hope on a cosmic, landscape-altering scale. It is enough that we carefully sustain beauty in the atmosphere of tragedy. The latest production from Brook’s French company, Thèâtre des Bouffes du Nord, has arrived in Los Angeles. Under the auspices of Center for Performance at UCLA, The Suit is currently finishing up a two-year international tour and will run through 19 April 2014 at Freud Playhouse. A simple show, it employs only three actors, three musicians and a few basic stage properties, such as chairs and clothes racks. 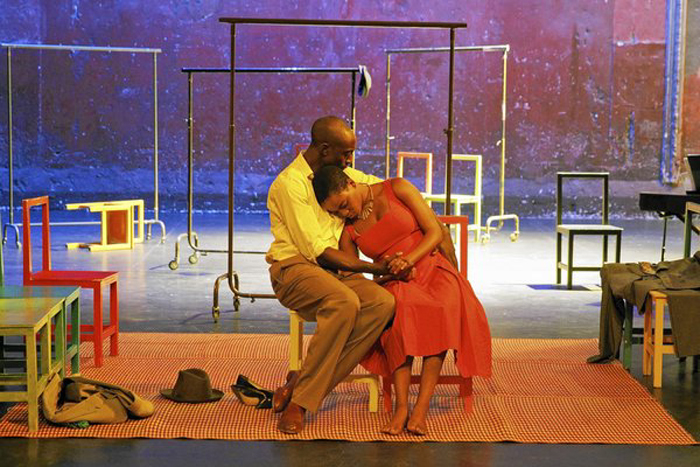 Philemon (Ivanno Jeremiah) discovers his wife, Matilda (Nonhlanhla Kheswa), in bed with another man. The lover flees, leaving his suit behind. The earth does not quake. There is no violence, no lack of civility. Philemon merely insists that the suit be treated as a guest of the house, a diplomatic reminder of his wife’s offense. Otherwise life goes on. But life going on is no small thing. The setting for The Suit is the township of Sophiatown west of Johannesburg during apartheid. It wasn’t pretty and pink, Philemon’s friend, Maphikela (Jordan Barbour), tells us. But it was alive. People lived ordinary lives, indulged in pleasures and tried not to think too hard about the oppression lurking around the corner, about the white police who took pleasure in cutting off the fingers, one by one, of a black guitarist before shooting him. They tried not to think about the fact that Sophiatown would soon be leveled and its residents relocated to a camp. Brook lets the story tell itself. These are gracious characters, enormously appealing. But humiliation is discretely poisoning the atmosphere. The play has the quality of a twentieth-century South African Othello. In Shakespeare, jealously is like an unsubtle Newtonian force, namely explosive. A Moor stands apart and is unable to control his emotions. There is clear-cut black and white. Iago, who taunts Othello, is all bad. In Sophiatown, white suppresses black. But Themba’s story – as adapted by Brook, Marie-Hèléne Estienne and composer Franck Krawczyk – is of blacks. Maphikela is not Iago. He reluctantly tells Philemon of the adultery and encourages Philemon to forgive and forget. Philemon does not mean to kill Matilda, on whom he dotes. But humiliation has a terrible power, and every gracious gesture on stage is the unspoken (though not unsung) reminder that this township is victim of the terrible humiliation of apartheid. What makes The Suit exceptional theater is the sheer graciousness of those gestures. Every actor moves like a dancer. Every actor speakers like singer. And song pervades all. Pianist and accordionist Mark Christine, trumpet player Mark Kavuma and guitarist Arthur Astier underscore the production with arrangements of Schubert songs, South African songs, African American blues, The Blue Danube and, of course, Bach. The music mainly serenades. Schubert’s Death and the Maiden may not be a subtle indicator but, heard played by a wandering accordionist, it is easy to ignore its significance. And that is the brilliance of The Suit. Brook has long been streamlining theater and opera, breaking down the distinctions between the narrative and the lyric stage. Movement is, for Brook, a purifying process. Music and speech only have meaning if movement does. Three years ago, also with the help of Estienne and Krawczyk, Brook reduced Mozart’s The Magic Flute down to its ritualistic essences, removing the magic and retaining the humanity. In The Suit, however, the horrors won’t go away. But by making theater, music and dance inseparably one, Brook’s art reaches that cleansing Bachian peak where beauty and humanity endure.